FlowHeater Designer 4.1.1.1 (32 Bit) was working fine with Office 2016 (32 Bit), was able to import from Excel to Access, now in the Configurator AccessAdapter when Load Schema I get "Error encountered while loading the schema information. Command text was not set for the command object. ", tried an un / re install of FlowHeater, which did not resolve. Was looking forward to purchasing with the Batch Module but now not sure how to proceed. I just can produce this error message in case the SQL text field in the Access Adapter configurator is empty or the SQL statement is completely wrong. Perhabs you just forgot to select a table? Please verify whether you have specified or selelect a valid SQL statement or table from the list? 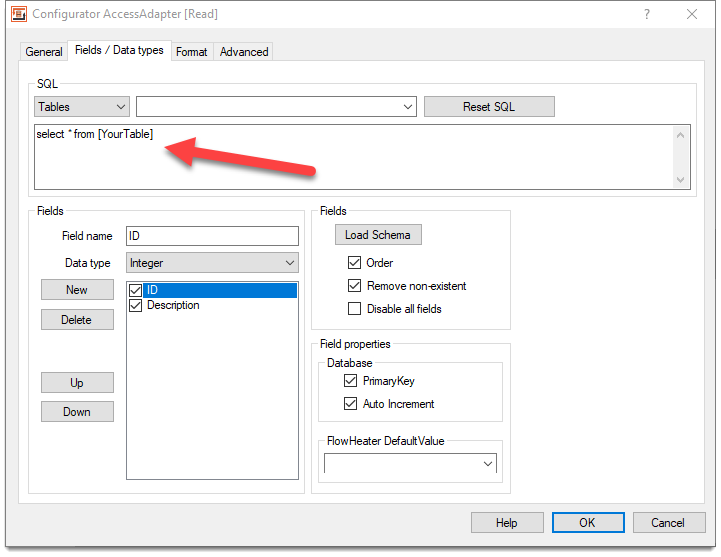 In case the SQL text field is filled valid please try to create a new definition and connect to your Access database, select the desired table and click the schema button again. I expect this should work fine now. If not? please post the created definition for detailed analysis, Thanks. That worked! Thank You!! Doing final testing today and if all works as expected I will make the purchase next week.